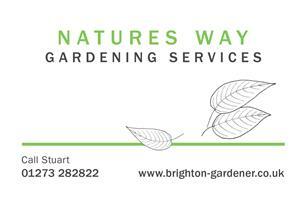 Natures Way Gardening - Garden Services, Landscaper based in Hove, East Sussex. Natures Way Gardening is an established company based in Brighton, Hove and the surrounding areas such as Lewes, Worthing and Saltdean. We pride ourselves in offering a professional gardening service based on reliability, excellent communication and have been managing a wide range of gardens and commercial properties over the past 12 years. Natures Way Gardening is fully insured and offers a garden and commercial waste collection service. We cover all areas of garden maintenance, new lawns and patio cleaning.